Federico García Lorca Granada-Jaén Airport, also known as Granada Airport, serves the city and province of Granada in southern Spain. Our in-depth guide to the airport provides useful information about the facility, including details of available terminal services, public transport access and nearby accommodation options. The airport information desk is located on Level 0 in the main Departures hall. From Granada city centre, follow the airport signs and head west along the A-92G main road, which leads past the airport access road (A-4075). 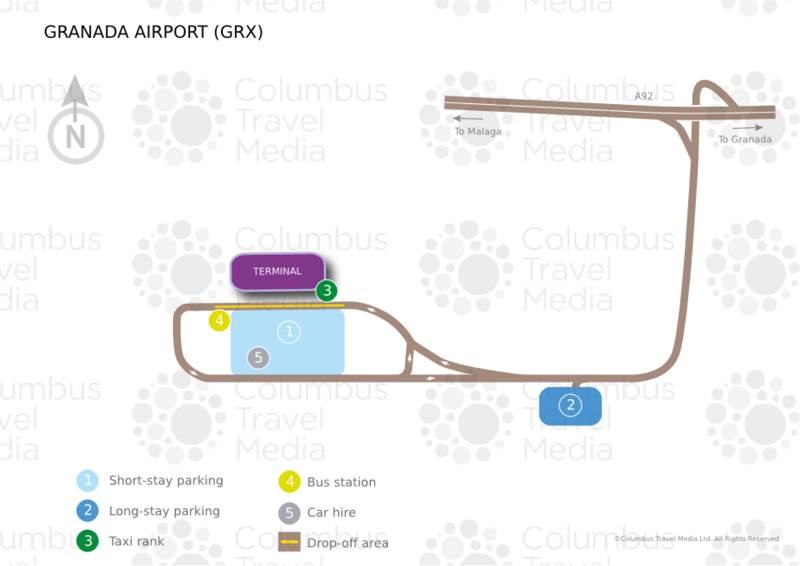 The total drive time to the airport from central Granada is approximately 25 minutes. The airport is located about 17.6 km (10.9 miles) west of Granada city centre. Bus: The Granada-Airport bus line (tel: +34 958 490 164; www.autocaresjosegonzalez.com) runs to and from the city centre. Journey time is 45 minutes, and the single fare is €2.90. Taxi: Airport based taxis (tel: +34 622 35 47 56) are available immediately outside the terminal. Prices into the city centre start at around €25, and the trip takes approximately 30 minutes, depending on traffic. ATMs are available on the ground floor of the terminal. There is a café in the public Departures hall, and another behind security, where there is a self-service restaurant. Granada Duty Free offers a full range of goods from local food, drink and souvenirs to the normal international cosmetic, perfume and alcohol brands. The shop is located in the boarding area. Luggage trolleys are available in front of the terminal, and in Arrivals. The Lost Property Office (tel: +34 958 245 249) is located in Arrivals. Other available facilities at Federico García Lorca Granada-Jaén Airport include baby changing rooms, a children's play area (free buggies are also available) and a first aid facility. There is a meeting room with capacity for up to 30 people for hire (tel: +34 958 245 200), available landside in the Departures hall, and another of similar size in the boarding area. Free Wi-Fi internet access is available throughout Federico García Lorca Granada-Jaén Airport. There is a public telephone in the arrivals hall and a mailbox on the ground floor of the terminal. The airport is fully accessible, with lifts and disabled toilet facilities. Designated disabled parking is available immediately opposite the terminal entrance. Passengers are advised to contact their airline in advance of travel should they require special assistance. 840 long- and short-term parking spaces are available immediately outside the terminal. Parking can be pre-booked via the airport website (tel: +34 91 321 1000). Car hire companies: Avis and OK Rent a Car are represented at the airport. Offices are located on the ground floor of the terminal close to the entrance.